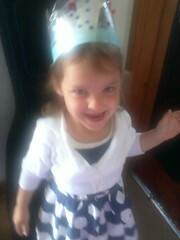 Friday- Another Jubilee Party & Rebecca gets a Gymnastics Badge ! Just a few catch up posts so I remember what we’ve been up to this week! 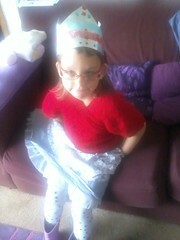 On Friday, the girls had their belated Jubilee Party in school. They wore red, white and blue and homemade crowns. They brought red, white and blue decorated fairy cakes and a jubilee fruit salad to school. After school, Rebecca had Gymnastics…and her group all completed a gymastics Badge…her first one. Caitlyn also brought home her first Merit from school. 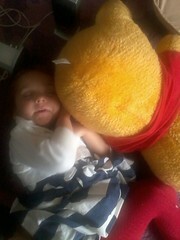 She was worn out after all the partying! Next Post Saturday-you know it’s a good party when your shoe breaks during the Macarena!